I have been following Belgian CAD software vendor Bricsys closely for many years now. The company has come a long way from being one of the many members of the IntelliCAD Technology Consortium (ITC) developing and selling their flavor of an AutoCAD clone they called BricsCAD. The company’s acquisition of the intellectual property of Russian CAD software vendor Ledas two years ago was a very wise move (see “Bricsys Acquires Intellectual Property Of Ledas“). This propelled Bricsys light years ahead of other companies it was previously grouped with. Today Bricsys has a very simple but profound mission – to unify 2D and 3D CAD. To drive the message in they have changed the tagline of BricsCAD to “Your unified CAD platform”. The idea is to allow design, engineering and manufacturing professionals to enter the world of 3D direct modeling without the need to leave their familiar DWG environment. And they intend to do this at a compelling price. 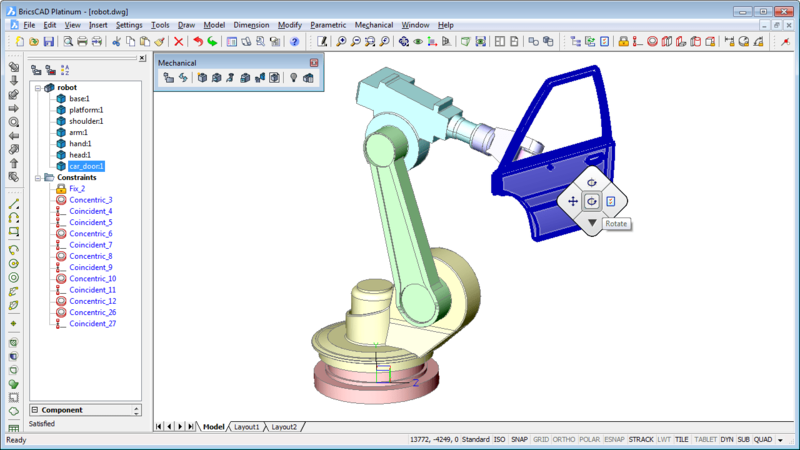 Platinum: Pro plus 3D constraints, design intent recognition and assemblies editing. Here is a video showing the basics of direct modeling as implemented in BricsCAD. Direct modeling first showed up in BricsCAD a couple of years ago in V12. For more information you can read my three part series titled “Direct Modeling in BricsCAD V12“. But mechanical design is not just modeling parts. It also involves putting them together into assemblies. So in BricsCAD V13 the concepts of assembly modeling and assembly constraints were added. I’m curious to learn what is going to be added to BricsCAD V14 whose release is scheduled to coincide with the Bricsys International Conference 2013 being held in Darmstadt, Germany on 15th and 16th of October. I’m on my way to attend the conference and hope to see for myself how far Bricsys has gone in fulfilling its mission of unifying 2D and 3D CAD.